Updated the Blogs/Personal Websites Page and added Social Media Security, Qualys’ The Laws of Vulnerabilities and The RSA Blog and Podcast Speaking of Security. Since I had no better page to put it, I included the site Cryptome to the White Papers and References Page. Also added to that page is Team Cymru’s Reading Room and The Register’s Whitepapers and tech resources. In case you aren’t familiar with Cryptome, they publish leaked customer privacy policies of corporations like Google, Microsoft, etc. As reported by The H Security, this report confirms the Verizon 2009 Data Breach Report, that the majority of attacks come from external sources (80%). Of all the successful breaches that were detected and analyzed (since even security experts can’t be 100% sure what kind of data was stolen) 85% were Payment Card Information. This supplemental report was released in the 2nd week of December 2009 and describes the Top 15 threats along with real world examples. Indicators and Countermeasures (or Mitigators) were also included. I really like the Indicators and Mitigators sections of the Threat Action Catalogue, since they can be easily integrated into a technical Security Awareness Program. If you’d like to access the the Verizon 2009 Data Breach Investigations Report, released back in April 2009, click here. The summary of which can be found here. – Improving information security risk management is top security priority for the next year. – External and internal attacks are increasing. – Reprisals from recently separated employees have become a major concern. – Availability of skilled information security resources is the greatest challenge to effectively delivering information security initiatives. – Despite most organizations maintaining current spending on information security, adequate budget is still a significant challenge to delivering security initiatives. – Security training and awareness programs are falling short of expectations. – Regulatory compliance continues to be an important driver for information security. – Cost compliance remains high, with few companies planning to spend less in the next 12 months. – Too few organizations have taken the necessary steps to protect personal information. – Implementing DLP technologies is the top security priority for many organizations. – The lack of endpoint encryption remains a key risk with few companies encrypting laptops or desktop computers. – Virtualization and cloud computing are gaining greater adoption, but few companies are considering the information security implications. Hello, I’m Xander and I’m a new contributor to the InfoSec Philippines blog. I was lurking on the Security Metrics Mailing list and the recent discussions were about Intel’s TARA methodology, which they’re using for their internal Information Security Risk Assessments. Intel’s methodology is centered on the most exposure that can be brought about by Threat Agents. Check out the whitepaper here. 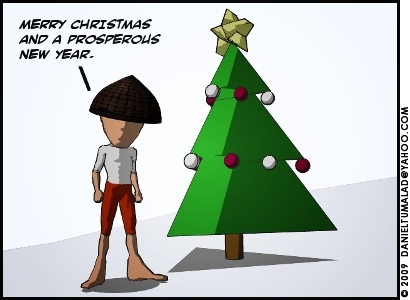 Happy Holidays from InfoSec Philippines! As 2009 comes to a close, we here at InfoSec.PH would like to thank everyone for supporting our site this year. We appreciate the comments and suggestions in improving our site to better help in spreading InfoSec awareness in the Philippines.